Last summer, I finally got a chance to travel across the scenic Babusar Pass on my way back from Gilgit. 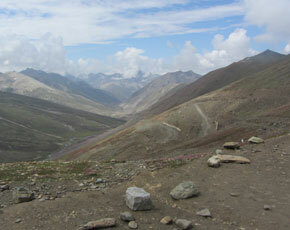 Just before Chilas, we turned onto a dirt track that leads to Babusar Top. Our mobile phones soon stopped working as we snaked up to the pass, the jeep laboriously making its way up the steep incline. There were a few scattered villages with little children in rags playing on the roadside. But what struck me the most was the lack of trees. There were hundreds of stumps along the road, so trees indeed grew here but they were all gone! Later on I found out that there were once thick forests in the area but they were all cut once a proper road was made across the top. It is a familiar story in the northern part of the country – once you build the roads, in comes the timber mafia and soon goes the forests and the wildlife that lives in them. “My village is just 4 km away from Babusar Pass – and I’m sorry to say that it was my own relatives who were involved in the cutting of trees in Babusar. It is completely bare now,” says twenty-five years old Khan Muhammad Qureishi who now lives in Islamabad where he is working and studying International Relations. The son of a policeman, Juma Mohammed Qureishi, whose family still owns other tracts of forests in Diamer District, KM Qureishi has turned into an active campaigner against deforestation. Diamer is a district in Gilgit-Baltistan famous for its forests and wilderness. Now both the forests and the wild beauty are rapidly disappearing thanks to an order passed by outgoing Prime Minister Raja Pervez Ashraf during his last days in office, to allow the transportation of legally and illegally cut 4 million cubic feet of wood to the rest of the country within four months. The controversial order led to an outcry by NGOs and civil society, and the media has drawn attention to this issue in the past two weeks. “Since the 1990s there has been a ban in the country on transporting timber down country to discourage deforestation, although of course there is an internal demand for wood in Gilgit and Skardu. Now thanks to this last minute order by the PM, they have started doing fresh cutting of trees. We have made videos of them cutting our forests in Diamer just last week and are going to release them to the TV stations,” explains KM Qureishi. He claims that since the order was passed on March 15th 2013, around 1000 to 1500 trees are being cut each day. The forests in Diamer are owned by the local communities, but are regulated under the Forest Regulations of 1970 and managed by the Gilgit-Balistan Forest Department. “My heart is really broken to see all the carnage taking place in Diamer. The youth of Diamer are taking footage of the cutting with their cameras and sending it to me. In some villages like Thak Juti, the villagers are stopping them. You see they rely on non-timber forest products (Chilgohzas (pine nuts), wild fruits and vegetables) for their income so these forests are valuable to them but where there is no unity in the communities they are being exploited”. By “they” KM Qureishi is referring to the powerful and well-connected timber mafia that is behind Raja Pervez’s last minute order. The timber mafia sells the wood in cities like Islamabad and Lahore for Rs 3,500 per cubic feet (for high quality Deodar), while Rs 25 per cubic feet (for Deodar) is all that the local people will earn from selling their trees. Some GB forest officials claim that the timber that had piled up over the years along the Karakoram Highway was starting to decay after being exposed to the sun and rain so this order is welcomed. But the IG Forests, Syed Mahmood Nasir, is himself upset with the implications of this order. Recently, he has been trying to implement the ‘Reducing Emissions from Deforestation and Forest Degradation’ or REDD mechanism in Pakistan, which is a good initiative under the global climate change agenda to decrease deforestation and enhance carbon stocks in existing forests. In his view, Pakistan can save and manage its forests by adopting REDD, which provides a mechanism to calculate the carbon stock that can be sold in the market or traded against funds for projects related to forests. Now with this rampant cutting of forests going on, he says he is “helpless” because the order is not under the purview of the federal Ministry of Climate Change. We just don’t seem to learn from all the disasters that have hit us in the north in recent years – the massive flooding of 2010 (made worse by deforestation) and the earthquake of 2005, which caused massive land-sliding in deforested areas. 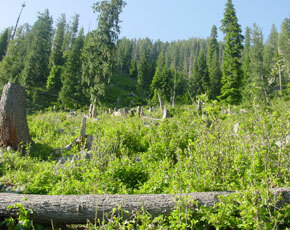 The 1992 ban on green felling was in fact, imposed by the federal cabinet after severe floods hit the region. In 2008 the Ministry of Kashmir Affairs and Gilgit-Baltistan submitted a summary to the federal cabinet requesting the relaxation of the ban on illegally cut timber after the imposition of fines. Permission was granted from February 2008 till September 2008 and the cabinet decided to confiscate the left over timber if not transported by that date. In August 2012 the GB Council was informed that 4.014 million cubic feet of timber was still left. The Ministry of Climate Change insisted that the remaining timber must be confiscated as per the cabinet decision but instead of doing that the GB Council, with the Prime Minister’s order, has allowed the extraction of this timber. Islamabad’s civil society plans to start a campaign and is hoping the interim Prime Minister of Pakistan “may take a note of the aggravating situation of forests in Gilgit-Baltistan and issue a directive for the withdrawal of Gilgit-Baltistan Council letter No. C-6(1)/2011 GBC dated 15 March 2013 for immediate stoppage of fresh timber harvesting”. They would also like the Prime Minister “to order strict compliance of the decision of the federal cabinet which required the confiscation of illegal timber to discourage deforestation in Gilgit-Baltistan”. In KM Qureishi’s view, “even the Supreme Court can take suo moto notice of the situation and stop the cutting of fresh trees. We want an assurance that in the next twenty years no more trees will be cut. There are still many forests left and if we take action now they can be saved. But with the cutting going on at this rate, these forest will soon disappear”. He has high hopes in the Diamer Youth Forum and other youth organisations of the area, which have now decided to block the Karakoram Highway in order to protest against the rampant deforestation by the timber mafia. “The timber mafia is just making a fool out of the local people and the youth realise that and they have taken the protection of their forests into their own hands”. Just goes to say the lack of interest in this subject, nobody has said anything. If the forests are being cut with such ferocity, something should be done to plant new trees at the same time. Batrasi forest near Mansehra used to be a very thick one with all kinds of wildlife found there, including monkeys, but now practically there is no forest left with a few tree here and there dotting the mountainsides. So the timber mafia is active from Abbottabad to all the northern areas , but seems like nobody is bothered about it or people prefer to keep quiet fearing for their lives. It really law of the jungle in a jungle of trees. May Allah guide us !! The timber "mafia" is foreign backed , just like some terrorist groups. You have to not only protect the forests of the North West you have to extend that climate to the rest of the country. Salute for writer for highlighting such important issue. While my recent visit to Mahandri, KPK, i felt so sad when i visited in 2010 and before that in 1997 when situation was even better then 2010, just three years back those mountain places which were covered with trees are just now empty with no trees left other then few here and there, and big wooden logs were lying along the road side. It's not only timber mafia but the demand in their own villages and cities for which they are cutting the trees. I request new PM if he cares for Pakistan to null and void such order or take Supreme court should intervene to stop our precious wood and trees for future generation. When do we learn from our mistakes. If we disturb the balance of nature then Nature will not forgive us in way of earthquakes and floods and land slide.. May G-d protect Pakistan from such ruthless timber mafias. It is not lack of interest - it is helplessness- total surrender. Pakistan's prime minister "Raja sahib" approved huge contracts to the timber mafia just before leaving the office (it was reported by the Dawn). The point being - what can a country do when its custodian is the biggest thief. Pakistan is in need of a Chipko Movement. Why bring Allah into everything? So what is new - some people will sell their mother for money, and trees are just a casulty due to man's greed. The people who are most affected long term themselves actively often engage in deforestation in their villages. Man is worse than animals - he burns his own village for profit. for heaven sake, please stop involving 'foreign invovlement' mantra... oneday i can forsee a protest in one of the city of Pakistan, blaming foreign involvement in the poor standard of cooking or irregular shape of CHAPPAATI, huh, foriegn hand. Since 1970 the timber mafia has disguised itself as the PPP. Vote for PTI. there is awareness on every issue. In sha Allah we will get back the lush green forests if we stop being selfish and vote wisely. It is not only a loss of view, it is a loss in terms of environmental changes for now and for the generations to come. Forest Department has generally failed to protect and manage natural forests throughout the Pakistan. They have resources and lot of manpower but timber mafia seems more powerful -- why not , they are backed by the political, civil administration and the Forest Department itself. Unfortunately forestry is very low in the national agenda. What people can get away here with ... The ex-PM issued such an obviously questionable order and yet it was not even mentioned in his election papers scrutiny. But I think who is most at fault are the local communities who themselves do not think of their forests. We need to move towards renewable tress forestation like in Australia. Under this management style the native tress will be protected and better yielding hardwood trees will be grown alongside, The whole issue needs better management. Trees are the most wonderful creation of nature. Destroy it at your peril! You are right... This made a lot of difference in India... I visit MP in india last month and i am so glad to see those forests there.. The timber that is already cut is not wasted by rotting. It provides essential nutrients to the soil that helps future forests be more healthy. It is a natural fertilizer and without human intervention that is how nature works. Planting new forest should be the strategy, ten saplings for each tree cut.